This compact drive from G-Technology contains two 2.5-inch disks. 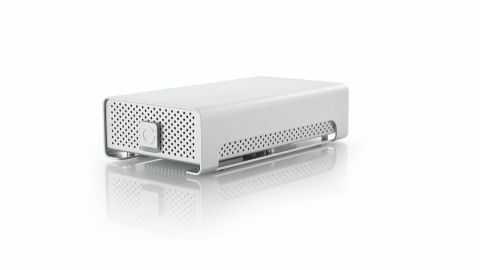 They're configured as a striped RAID array for speed, and appear as a single 2TB volume in the Finder. Its USB3 port offers the best speed, but FireWire ports are also present. Over USB3, the drive achieved respectable averages of 216.2MB/sec when reading data sequentially, and 170.4MB/sec when writing it. These figures are dragged down by speeds under 100MB/sec when handling small files, however. Random read and write speeds might be encountered after long use, when free space becomes fragmented. Here, though, the drive is lacklustre. It averaged 22.9MB/sec when reading data, and 35.6MB/sec when writing. The drive can be reconfigured as a mirrored 1TB array as insurance in case one disk fails, but the disks can't easily be swapped out. The application for this requires Java to be installed. G-Technology's website confused us with an instruction that one of two versions of the app is for serial numbers ending with two letters. Ours didn't, yet that was the version we needed. FireWire 800 limits speeds but forgoes the need for the mains plug. Beware, this doesn't work through Apple's Thunderbolt to FireWire adaptor - an issue with the accessory - so a mains supply is required in portable use with a MacBook Air or a Retina MacBook Pro.